Islam in Europe: France: Najat Vallaud-Belkacem, The official "face" of the new French government. 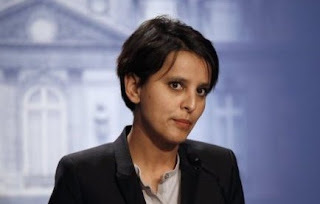 France: Najat Vallaud-Belkacem, The official "face" of the new French government. Thirty years ago, a four-year-old Moroccan girl emigrated to France to join her father. Yesterday, she became the official "face" of the new French government. Najat Vallaud-Belkacem, 34, is the youngest member of the cabinet which assembled yesterday under the chairmanship of President François Hollande. She is the Minister for Women's Affairs and will be the official spokeswoman for the government and, therefore, the mouthpiece for "Hollandism". A married mother of twins, Ms Vallaud-Belkacem is a "non-practising Muslim". After winning scholarships to elite colleges, she calls herself a "pure product of the [egalitarianism] of the [French] Republic". She insisted yesterday, however, that she wanted to be judged on her abilities, not on her "triple symbolism" as a young female of North African origin.